Here's a great winter camping opportunity posted recently in Rich and Sue Freeman's New York Outdoors Blog - one of the very best Internet resources for all things outdoors in New York State. Have you ever wondered how and why people go camping in the winter? What drives these crazy people to leave their warm abodes to go out in the winter to go camping? And you see them with smiles on their faces talking about it before hand and afterward with this far off gleam in their eyes. The skills that you will learn can and will be applied to your daily living, without you even realizing it. They have literally taught hundreds of people over the last 15 years winter camping and they coming back so we must be doing something right. If you don’t get hooked on winter camping, you will at least be able to tell your grandkids you were a winter camper! When we go camping we take two teenage boys with us. Much as they love roasting marshmallows and telling ghost stories by the campfire, they love being on their own even more. So after an hour or two of being helpful and great company, both boys tend to disappear from our campsite. Eventually we have to track them down. This can be tedious and time-consuming. It didn't take us long to adopt the strategy used by other campers in similar situations. We bought walkie-talkies and insisted the teens take one with them. This worked fine until the guys discovered how easy it was to pretend they were out of range, or only heard mysterious static. "The batteries musta been dead," one would volunteer after a couple hours among the missing. Now we've fixed that little communication breakdown for good. We bought better two-way radios from Motorola. Yeah, we spent more money than before, but not much - still way under $100 for the pair. We chose Talkabout® 2-Way Radios because they looked rugged and boasted a much higher range than our original radios offered. Best of all, these use rechargeable batteries. I got really tired of buying 8-packs of AAA batteries for the old ones. The kids like the Talkabouts® because they are big, black, and look like something an Army Ranger might carry. There's a nifty extra trick, too: you can use these 2-way radios hands-free! Sound clarity is fantastic, so no more "what??" for an answer when we try to find our kids. There's even a setting that eliminates interference from non-Motorola radios. The 22 available channels offer over 100 privacy codes, too. 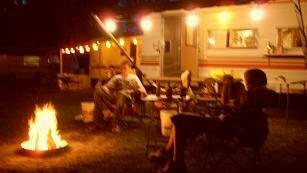 None of the campgrounds we stay at are nearly big enough to exceed the 5- to 10-mile rural transmission range. These radios are solidly built, with a nice big flexi-antenna that reminds me of the ones on those ancient Motorola "brick" phones. That's probably why the effective range is so high. Talkabouts® can receive NOAA Weather Radio Alerts, too (where available). That helps with peace of mind if a big thunderstorm is about to roll in, for instance. For real emergencies there's an Alert button that sends a distress signal AND transmits background noises, too - just in case. Each unit also includes a built-in flashlight! They came with a handy charger stand that plugs into any regular outlet, and include ports for charging via mini-usb - same as the boys' mp3 players use. So far our kids haven't yet managed to scratch or dent the units, despite frequent hard handling. Can you get by with a $30 pair of off-brand walkie-talkies? Sure, and we did for a while. But we spent the price difference on batteries and frustration that first summer. We'll end up buying another pair this summer, since my oldest now likes to go off on his own without his kid brother tagging along. I think I'll Free-cycle our old, original 2-way radios and let someone else buy the batteries. I'm sold on the Motorola Talkabout® radios, and very happy to be able to track down my children at the campground. 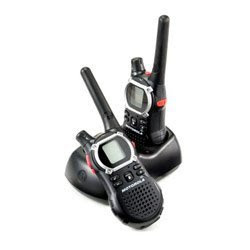 Motorola Talkabout® 2-Way Radios - EM1000R FRS/GMRS radios. Suggested retail is $69.95. Available online or at retail electronics stores. 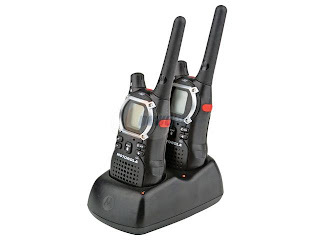 From Motorola's 2008 press release: "The Motorola Talkabout® EM1000R two-way radios not only keep family members in touch with those that matter most, but also provide peace-of-mind knowing that everyone can enjoy their adventures without missing important emergency or weather alerts. True Camping Stories: Alien Abduction in the woods? Back in the days when I loved camping and would sacrifice anything to spend a night under the stars, I decided one day that it was time for my eldest daughter and I to venture into the mountains of Pennsylvania together. August in Maryland is an oppressive month, with temperatures often climbing into the upper nineties. So, I considered it a wise choice to get away from the humidity, and hustle and bustle, for some father/daughter time. My eldest daughter was about to turn the ripe old age of twelve the following month, so she was definitely mature enough to spend quality time with her old man and learn the art of building fires, hunting for sticks and chasing away bugs, etc. For safety, I picked a well known camp site which I thought to be heavily populated. 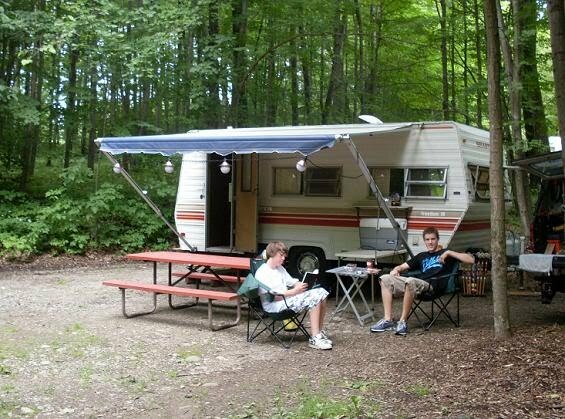 We had often camped there before when my children were much younger and the memories of swimming in the large outdoor pool, playing ping-pong in the camp communal hall, plus the Pennsylvania Ice Cream at the camp store, reassured me that my daughter and I would not have time to get bored. It was late August and to my surprise, I discovered that the camping season at this particular park was almost over. With summer still in full swing at ocean resorts a couple of hundred miles east, I was kind of shocked when the camp site staff let me pick any location that I wanted. We drove up the rocky path to the tent area and started to scour the park for somewhere to pitch our six-man tent. Now this tent hadn't been used for about a year, so I knew I was in for some head-scratching quality moments. With about twenty different color-coded tent poles, most of which were missing those color-coded stickers - and the fact that dusk was just around the corner, I knew that I had better find my thinking cap and at the same time, not let my daughter see the chink in my rusty armor. After about an hour the tent was finally erected and, thanks to some nearby rocks, I had managed to get all the tent pegs into the hard flat ground before nightfall. I must say that necessity is the mother of invention, and it also pays to carry a hammer. As night's rapidly falling dark blanket engulfed us, it became more noticeable that we were in fact the only human beings in the area. The locusts, however, up in the large tree that towered above us, were in full harmonious swing! The fire was comforting for me. The branches that we had gathered were crackling joyously, but the chant of the locusts grew louder and louder. My daughter kept looking at me with cow eyes and an innocent smile. Little did she realize that her old man was starting to get freaked out. For me, it was sort of like taking a boat ride when, all of a sudden, the engine gives out, the oars fall overboard and a storm starts to loom on the horizon. In this instance, the storm was the long night ahead and the locusts were the huge waves, lapping up against the hull of our little boat. My daughter seemed to find our adventure amusing. She played with sticks, poked the fire and basked in the secure glow of her father. (Little did she know!) Eventually, the fire died away, the late hour tapped upon our eye lids and we retired to our tent for the night. Somehow, I managed to find comfort and rhythm in the sound of our relentless, nocturnal locust friends; and I fell asleep shortly after my daughter hit the proverbial hay. It was still dark when my daughter and I were awakened by an unearthly sound! I checked my watch and it was around four o'clock in the morning. I had to go to the bathroom really badly and so did my daughter, but I was too afraid to open the tent flaps. Maybe it was because I had watched too many science fiction movies? Perhaps it was because my daughter had also been subjected to bad Sci-Fi on the television?..... We both looked at each other via the illumination of florescent light emanating from my wrist watch. The sound that we heard sounded exactly like a space ship hovering outside of our tent. 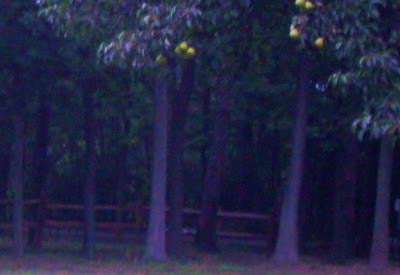 I felt absolutely sure that an alien life force had scoped out a couple of lonely campers in the Pennsylvania Hills. 'There were to be no witnesses as to our disappearance and when we returned, no one would believe our story!' Perfect Alien Abduction! !....I thought. The sound did not stop! Our bladders were talking furiously, so I broke down and unzipped one of the tent flaps. I looked, but could see nothing! As I stuck my foot out, the sound stopped. I climbed all the way out and stood up. The sound started again, but farther away. My daughter grabbed our one and only flashlight and joined me. We both stood for a while surveying the immediate area. The sound stopped again! Just as we drew a sighed breath, the strange noise began again; but this time it was even further in the distance. We looked at each other and giggled nervously. I made a comment about Martians and my daughter made one about Star Trek. We both made our way to the bathrooms, which were a few hundred yards away, then we returned to continue with our sleep in the best way that we could. Luckily, the sun rose and so did we. I was not only thankful that we were still alive, but I was also thankful that the locusts had stopped. However, I did wonder if we had actually been abducted and if our memories had been erased? But I decided that it wasn't worth considering, seeing that there was no memory to make me any the wiser. We had slept in our clothes, (this is the beauty of camping in my opinion), so we simply got up and made our way to the camp store. There were two people there, one drinking coffee and another waiting to serve us at the store counter. I gathered some eggs, bread, bacon and a cup of Joe. I couldn't help thinking about the 'ungodly' noises we had heard just a few hours prior, so I opened my mouth and mentioned something about our almost third encounter. The store manager asked me what the noise sounded like. So I took a sip of coffee, wet my whistle and proceeded to impersonate the best that I could. "Scroooooooooooooooobleewooooooble!" The other person in the camp store turned their head. "Why, that's the mating call of a raccoon!" he knowingly exclaimed. I often wonder if my daughter ever realized that her dear 39 year-old father, at that time, was scared out of his wits? But I guess I'll never know.